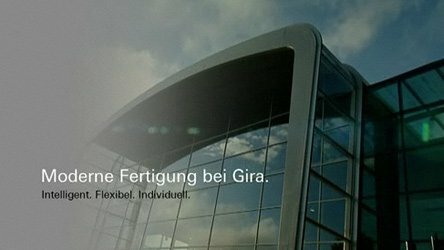 Gira was founded in 1905 and, today, with more than 1,200 employees and representatives in 38 countries, it is counted among Germany’s leading medium-sized companies in the electrical industry. It manufactures switches and socket outlets, in addition to a wide range of electrical installation systems, including for the fields of communication technology, door intercoms and the automation of heating, light and blinds. Gira products and systems can be found in a wide variety of properties, from the Lufthansa Aviation Centre and the Hoechst management board building to kindergartens, schools and common residential buildings. At Gira, the demand for new product developments is very high. Gira quality products have received numerous awards and their launches are always met with great enthusiasm on the market. Computer calculations for design, state-of-the-art machines for production, as well as precision handiwork when required for details, teamwork and complex organisation from order placement to delivery, plus a wide variety of services. It is a complex system with intelligent control that Gira can use to fulfil customer requests in a flexible and individual manner.